Last week I really wanted to go to Home Outfitters. Upon cleaning my wallet I had found a long forgotten $60 gift certificate to HBC, which includes the Bay, Home Outfitters, and Zellers. Now, the Bay doesn't have much to interest me, and Zellers is all the way out in the suburbs, but Home Outfitters is right up my alley! Unfortunately it is an hour by TTC from work so I couldn't go last week with all my camping preparation. So I went this week!! 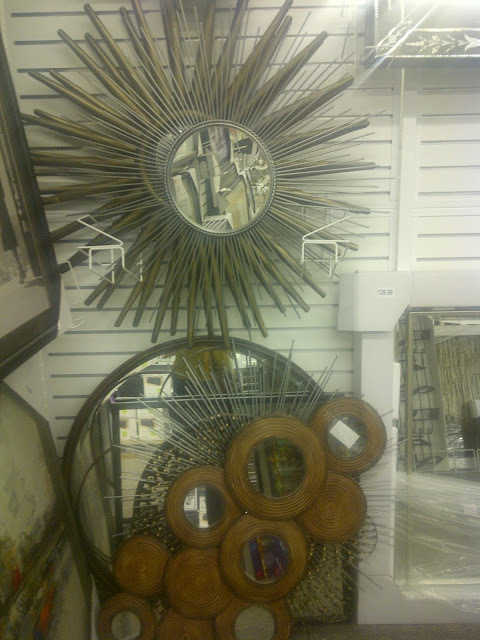 I was very excited for this expedition to Yorkdale Mall, as I was hoping to score a pretty mirror for my living room. See? I don't forget these things- I just procrastinate. haha. 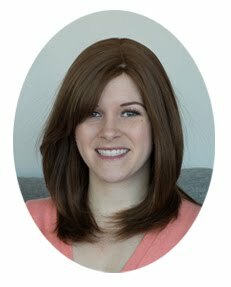 I had been waffling over DIY vs buying this mirror, but I really felt like a DIY option wouldn't look as nice in person as I have seen on other blogs. Plus I am lazy. So to Home Outfitters I go! 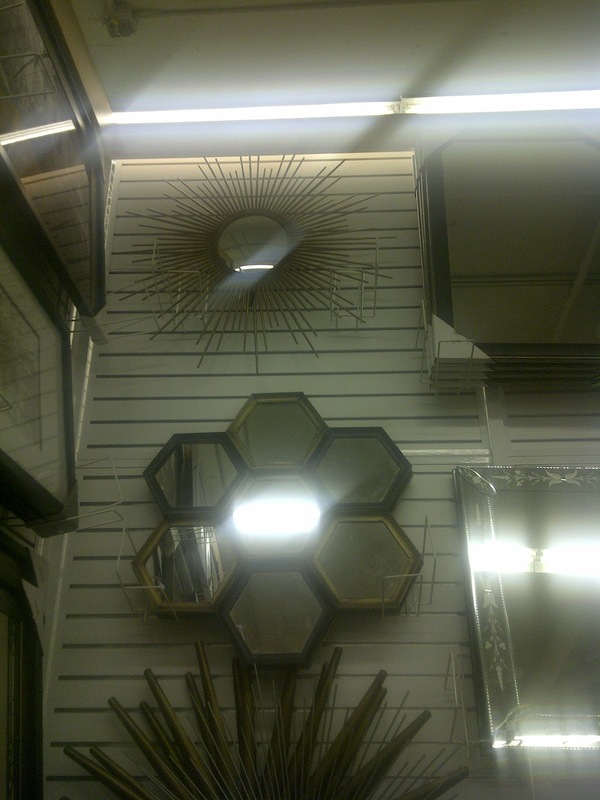 Upon arriving I found LOTS of pretty mirrors. I was initially attracted to the silver one in picture two (with thin silver spikes). Except upon closer inspection, the two they had in stock were totally bent. Plus they were missing price tags. Then I really started to warm to the mirror at the top of picture one. 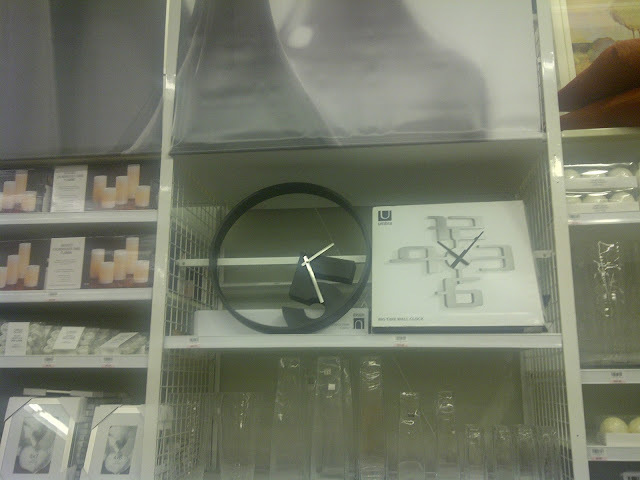 It looked much less "cheap" than the bent ones and had a fun convex mirror. I didn't love the bronze finish, but I thought I could paint it something fun. But alas, I am not 10 ft tall so I couldn't even check the price. I went to the cash registers to find an employee (other side of the store!) and they paged someone to "mirrors" to help me. However no one came to help me. So THEN I went and found an employee who was using a ladder and I asked her to help me with the mirror. She rolled over a clearly-too-short ladder and I asked her to check the price first (I didn't want her to lift it down if it was out of my budget). She scaled that ladder in a way that is in NO WAY safe and said it was $129. I said "sounds good!". Then she climbed down and walked away. I assumed she was getting a taller ladder in order to lift the mirror down. But she never came back! I later saw her restacking stock elsewhere. I mean, this is retail! You should try to close a darn sale, even if you aren't on commission! She must have interpreted my "sounds good" as "dang, that is a good price for a mirror so I am going to leave it on the wall for someone else". Anyway, in this awkward interim time I started second guessing my choice and my ability to carry it home. But I did buy something pretty which I will show later this week! I did spend some time window shopping for things I don't need, so I thought I would share. I thought these three colourful prints were super cute for a bright, fun, bathroom. 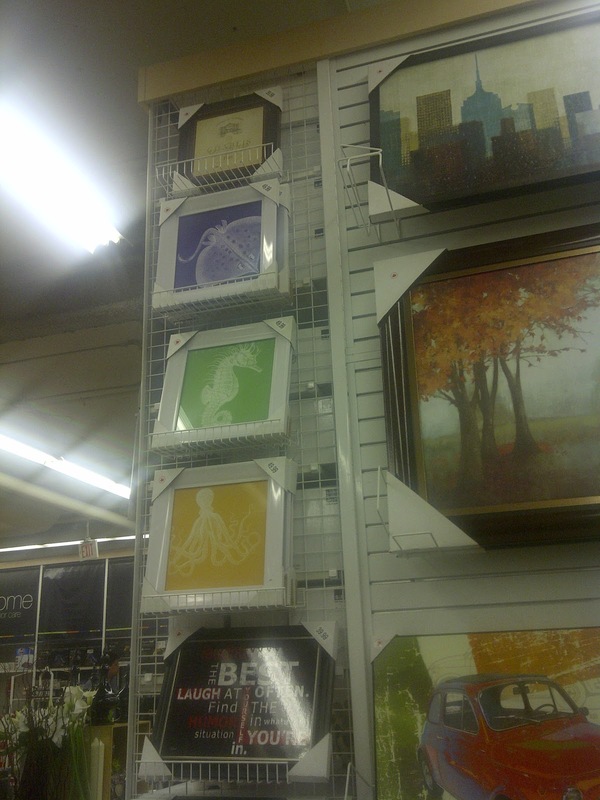 However they were $49.99 each and I am pretty sure you could find a better deal for sea-inspired prints on Etsy, or even DIY some. 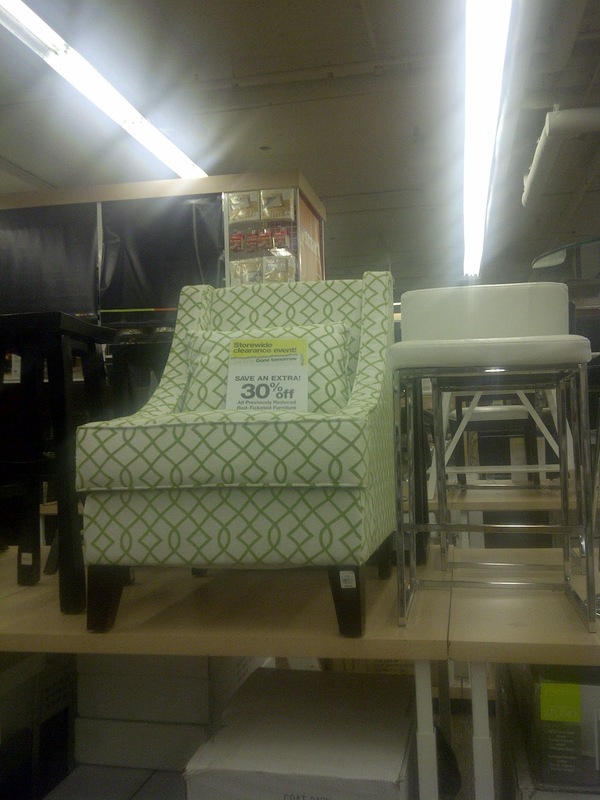 This chair was $299.99 (and I couldn't figure out if it was 30% off like that sign says because it referred to red-tagged items and this wasn't red-tagged). I loved the green graphic pattern! I thought this clock would look great in a modern room! But I would take the batteries out and put it in a bar, always pointed to 5pm!! I saw these at a Solutions store a month or so ago and I loved them then and I still love them now! 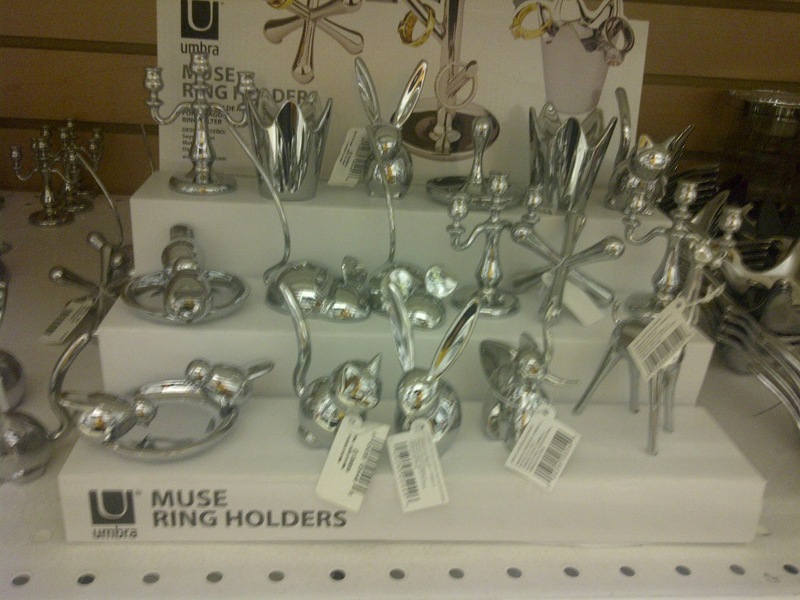 They are fun ring holders! My favourite is the giraffe (bottom right). They were $10 each.